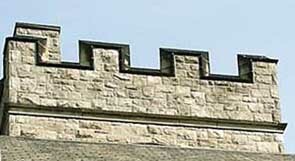 Merlon: The solid upright section of a battlement or crenellated parapet in medieval architecture or fortifications. Merlons are sometimes pierced by narrow, vertical embrasures or slits designed for observation and fire. Battlements were mainstays in Medieval forts. .| ...Home Page ...| ..Buffalo Architecture Index...| ..Buffalo History Index... .|....E-Mail ...| . web site consulting by ingenious, inc. .